Social media plays a critical role in communication and reaching out to the general public. Novel innovations, such as wireless technology, MP3 podcasts, and internet radios, are transforming the way in which we receive and process information. There is practicality in utilizing the radio for purposes such as promoting advocacy, increasing education and consumer awareness, initiating peer-peer communication, and promoting agencies, resources, and services. Each week, approximately 93% of Americans ages 12 and above listen to the radio. This statistic provides support for the use of radio podcasts as a tool for interventions in the field of social work practice to improve consumer awareness in rural communities. 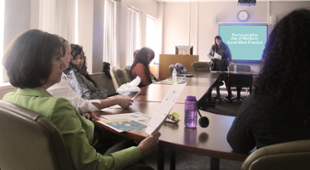 In 2008, the School of Social Work (SSW) at SIUC conducted a needs assessment among senior nutrition programs in order to identify ten specific areas that older adults wanted to learn more about. Topics included caregiving and depression, caregiving and Alzheimer’s disease, caregiving burnout and compassion fatigue, grandparents raising children, end of life care, grief, and loss, and more. Once all topics were identified, SIU’s School of Social Work (SSW) partnered with Caring Counseling Ministries (CCM) in Marion, IL, WGGH Radio Station, and the “Dare to Care” radio show, a talk show that discusses topics in caregiving on a monthly basis, to create a program intended to help consumers make informed health decisions and seek care based on informed decision making. The SSW faculty worked with a CCM intern to develop scripts for the “Dare to Care” radio show. These scripts were then formatted into a CD and transformed into a therapeutic workbook to create a module package intended for individual use. Each module explores statistics and facts about the topic area, common concerns, evidence based solutions and interventions, available contacts and resources, and action steps to help with caregiver concerns. The program development team hopes to field test modules to identify the effectiveness of this intervention and its impact on reducing caregiver stress and depression. The team also hopes to obtain financial support to replicate materials for consumer use, and to continue the series into parenting issues.